Amudat/Napak- At least 104 people who were last week taken to various health centres in Amudat and Napak districts after eating poisoned porridge, were on Monday discharged. The porridge was supplied to them by the World Food programme (WFP). Seventy people were discharged from Lotome Health Centre in Napak District while 34 were discharged from Amudat Hospital in Amudat District. Dr James Lemukol, the Napak District health director and Dr Peter Kusolo the Amudat District health director confirmed that they have not received new cases in the two districts. "We are left with only two patients and I believe they will discharged soon because they are responding well to treatment," Dr Lemukol said. Dr Kusolo said they are also treating two people at Amudat Hospital. 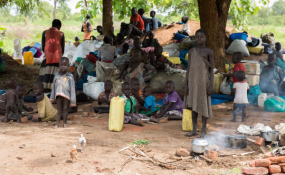 Karamoja region was last week thrown into panic after WFP, the lead agency in fighting hunger in the famine-prone area, distributed Super Cereal porridge, sugar and cooking oil to 120 families at Alakas Health Centre II in Amudat District, which turned out to be poisonous. Families that prepared and ate the porridge developed health complications and were admitted with various symptoms including high fever and mental confusion. Similar cases were on Saturday reported in Napak District. Two people have so far died after eating the poisoned porridge. To address the problem, the international food agency has suspended food distribution in the region until the cause of the problem is discovered. Mr Peter Smerdon, the WFP communication Officer based in Nairobi, said that the UN food agency is working with Ugandan authorities to establish the cause of the suspected food poisoning. "We have decided to suspend distribution of porridge flour in Karamoja until further notice and the WFP team of experts is working with Ugandan experts to get to the root cause of the problem," he said.